I remember my Grandma having one of those old school photo cubes, the kind where you can see an image from every side, slipping the photo under the plastic frame. Well, I thought I’d re-create that for a fun Mother’s Day present, but with the magic of Mod Podge. (This would make a great handmade Father’s Day gift, too). * square block of wood – I got my wood blocks from Home Depot. I bought a 4×4 piece of wood and the nice man cut it into cubes for me! Then I sanded each one down. * 6 photos – You can either use real photos or print some off on your computer. The real photos are best as the ink won’t smear at all, but on the photos that smeared a little, looked kind of old fashioned, which I like. * Mod Podge & sponge paint brush. 1. 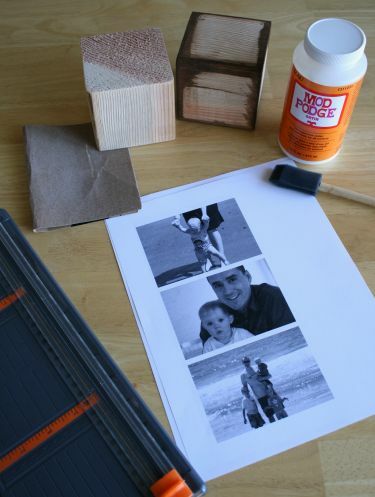 For your wood block, you can paint it first or leave it plain. I did both, just to see the difference. 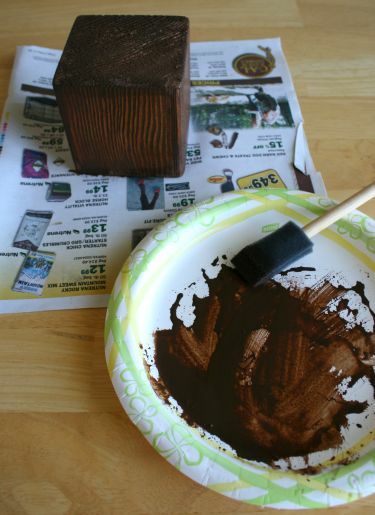 For the brown acrylic painted block, I added a little water to the paint to make it more of a stained look. Or these would be cute with pink or blue paint, or even some fun scrapbook paper mod podged on first, under the photo. 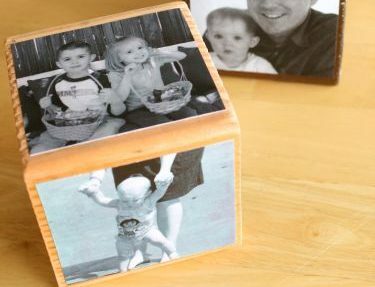 2.Cut out your photos to fit the cube. I cut my first one out then matched it up to the others, cutting them all out at the same size. 3. 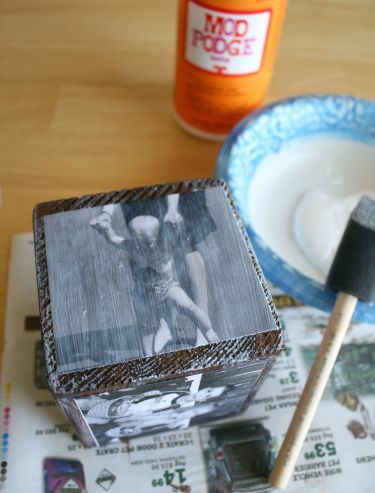 Apply mod podge with your sponge brush to the wood square. Then press one of the photos in place. You can do about 3 of these at a time, then let them dry. Then apply and press the other 3 photos. If you dry your block on wax paper, it will come off a little easier than on newspaper. 4. 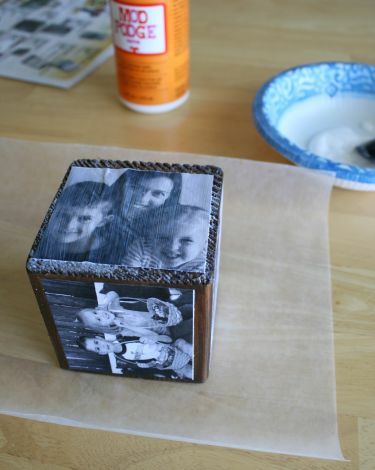 Once the all the photos have been applied and dried, apply one more coat of mod podge to the whole cube in sections. Then let it dry over night, making sure it’s dry and sealed. Now it’s ready for a Mom! She’s going to love seeing those cute faces. But she’ll probably have a hard time deciding which picture to display on top! Great idea. I hope I get one. 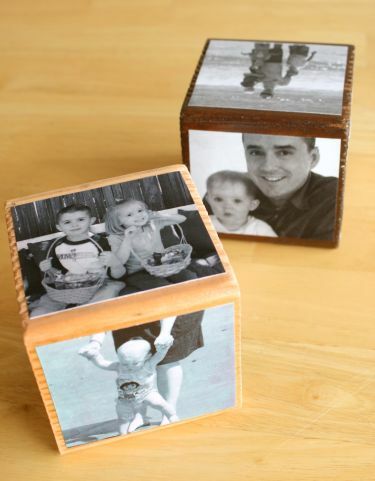 Excellent project to do with kids for any special day or just to make some photo cubes for the office. They look so lovely when they are stacked up one over the other. That’s such a good idea. I particularly like the effect when they are stacked. We’ve had Mother’s Day already here in Spain but I think my son would love making some of these. He’s fascinated with photos of himself when he was younger so he could make some for his bedroom and his grandparents. I’ve bookmarked this as he has a 13 week summer holiday coming up quicker than I’d like so we’ll get cracking then! Those are adorable! What a super idea. I love this idea! I am thinking that this would be a great gift for grandparents. awesome! I so plan on making these. i have a lot of 4X4 left over from making our fence so I think it would be a great way of recycling what i have. I made one for my hubby for dad day, it came out great! thanks for the good idea, I see easy grandparent gifts in my future!! I loved this idea and used it for centerpieces at my son’s wedding rehearsal dinner. Check out the photos on my blog. Thanks for the inspiration! 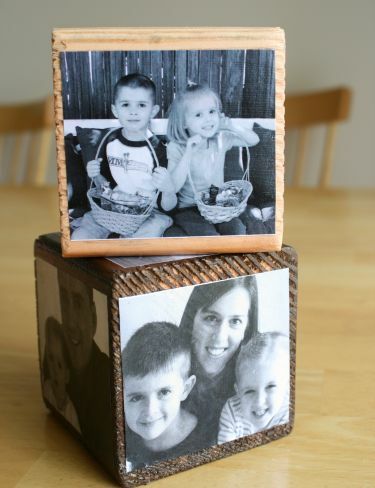 There is a web site which will allow you to make a photo cube without the wood block. 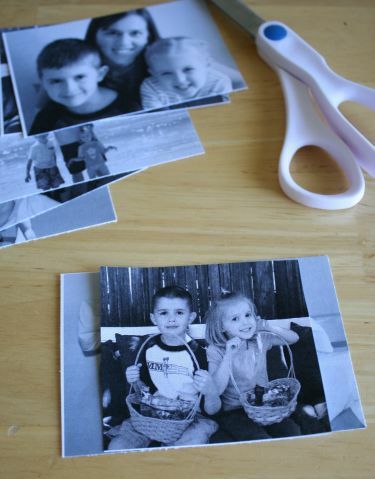 The http://easyphotocube.com site makes a paper pattern for you with your pictures and messages on it. I just found this – I had this idea in my head for a while, and I thought I knew how I would do it but decided to google instructions in case I found any helpful tips – which i did! I really liked your idea to water down the paint to make it look more like a stain, and also for using wax paper underneath. Thanks! I love this and have tried it in the past. Every one I have done has bubble eventually. Any ideas how to stop this from happening? Thank you! Awesome post, this is gonna keep me busy for a while now!